A Newbery Medal winning modern classic about a racially divided small town and a boy who runs. Includes an introduction from Newbery Award-winning author of The One and Only Ivan, Katherine Applegate. 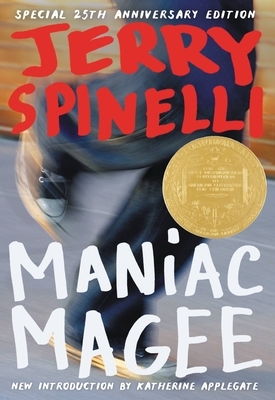 Jerry Spinelli is the author of over fifteen immensely popular books for young readers, including Eggs, Stargirl, Space Station Seventh Grade, Newbery Honor winner Wringer, and Maniac Magee, winner of more than fifteen state children's book awards in addition to the Newbery Medal. He lives in Pennsylvania with his wife, Eileen. His website is www.jerryspinelli.com.